Published: Aug. 8, 2011 at 08:16 p.m.
Ex-offensive line coach Juan Castillo, now the Eagles defensive coordinator, has been handed a "dream" lineup. BETHLEHEM, Pa. -- More than halfway through a conversation with Eagles general manager Howie Roseman over the weekend, he interrupted me and said, "We haven't even talked about the offense yet?" And when you think about it, who is? Sure, DeSean Jackson's holdout and the signings of Vince Young and Ronnie Brown brought some attention to that side of the ball, but the stockpiling of stars and depth on what used to be the stepchild portion of Philadelphia's team is why this team is generating so much hype. It's so hard not to buy in either. Cornerbacks Nnamdi Asomugha and Dominique Rodgers-Cromartie were brought in to shore up a position group that already featured Pro Bowl corner Asante Samuel. The stockpiling of defensive linemen -- Jason Babin, Cullen Jenkins, Anthony Hargrove -- is almost absurd. It wasn't like that cupboard was bare with Trent Cole, Mike Patterson and Juqua Parker already in place. It's hard to understand how potentially potent the pieces are until you see them all on the field at the same time or rotating into the lineup. The Eagles look impressive on paper. They look even more impressive in pads. And we haven't even talked about the offense yet. "(We) made some great moves this offseason," said rookie middle linebacker Casey Matthews, who is working as the starter and is the only real greenhorn on this unit. "People are labeling us as the 'Dream Team', Super Bowl contenders. Right now, the Packers are the Super Bowl champions and until they're dethroned we can't talk about being Super Bowl champions. "But (management) put us in position to have a great team (with) the coaches (we) have here and this being the great organization that is." On the issue of coaching, the defensive line is in the hands of highly regarded line coach Jim Washburn, who built some stifling fronts with Tennessee and was the last coach to get much out of the talented but enigmatic defensive tackle Albert Haynesworth. So put a check next to another potentially great addition. Defensive coordinator Juan Castillo is a first timer. He's a longtime offensive coach with the Eagles, most recently leading the offensive line. That should give him ideal insight on how to navigate and exploit certain protections and schemes. However, he has to call plays in the heat of the moment. That's not easy. He's been calling his defenses through a headset -- just like in games -- in training camp to get used to the process. The Eagles tried a first-time defensive coordinator two years ago when they promoted Sean McDermott. That didn't work. The shadow of the late longtime defensive coordinator Jim Johnson was too fresh and too broad. McDermott's defense last season was a relative sieve in the red zone and in the passing game. Johnson's shadow remains. 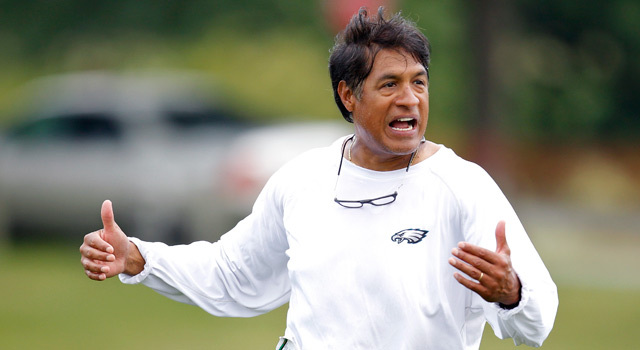 Castillo coached against Johnson in practice for years as he came through the Eagles' coaching channel. He learned a lot from Johnson in trying to outfox him in practice. We'll see how well that applies. Roseman and the Eagles front office have no concerns that the highly energetic Castillo will succeed. Without saying it, it's clear Roseman believes things will work, in part, because Castillo was delivered an assemblage of playmakers that can cover for any glitches. All this talent could end up being like five all-star point guards who are fabulous with the ball in their hands but miscast when they have to be set up to score. Last season, defensive end Jason Babin (12.5 sacks), Trent Cole (10) and tackles Cullen Jenkins (seven) and Parker, combined for 35.5 sacks. Babin was with the Titans, Jenkins with the Packers. Samuels and Rodgers-Cromartie combined for 10 interceptions. Asomugha didn't have any, as is pretty common since he's rarely targeted. This is a two-tiered drag net that can force bad throws with pressure, either self generated or caused by supreme coverage. The Eagles allowed 31 passing touchdowns, among the highest in the NFL last season. Unless injuries ransack the frontline talent, that total should decrease -- as was the goal in pilfering so much talent from around the league. Then there is the potential downside. Talent doesn't always fit scheme. We've seen time and time again where a player excelled in one system and couldn't get out of his way when he changed. This is where Castillo has to be brilliant. All this talent could end up being like five all-star point guards who are fabulous with the ball in their hands but miscast when they have to be set up to score. In this condensed period of make things fit, there isn't enough time to adjust to so many different skill sets. That's where staging matchup advantages and being creative within the core set will be the focus. The potential for things to go wrong always exists, especially with a new coordinator. The layers of insulation seem so thick, though, it might be hard to mess this up. And we still haven't talked about the offense.